Can you believe it’s already March? I’d hoped to write that the birds are singing, the tulips are waking, and Punxsutawney Phil the Groundhog was my hero this year. However, right at this moment, there’s still a thick layer of ice in my yard and it’s snowing. Still, there’s something to be said for a cup of coffee in a warm house watching the snow softly falling outside. And though February was a short month, there’s been excitement – and I have good things to look forward to! HAPPY NEW YEAR! I hope you had a great holiday season. 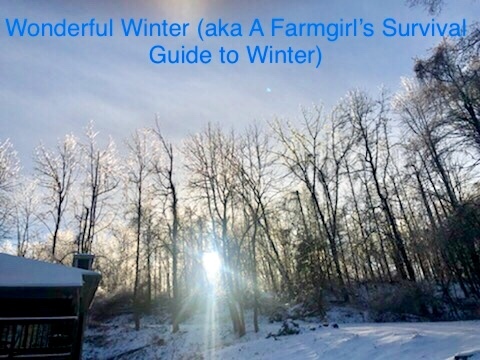 December here was wonderful, with friends and cheer surrounding us. 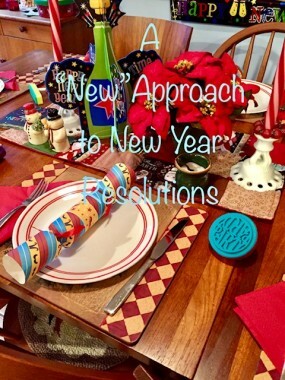 This year, I’m not making a “new” New Year’s resolution- instead, I’m sticking to a “different” way of thinking, and THAT’S made all the difference! One of the greatest gifts in life is the simple act of giving to others. “Giving” doesn’t have to be a big act or a large monetary sum. Sometimes, the simplest acts of kindness go a really long way, and keep on giving. Summer’s flown by! For us, it wasn’t the best of summers (disgustingly humid, extremely rainy and boiling HOT), though we did have some great moments. 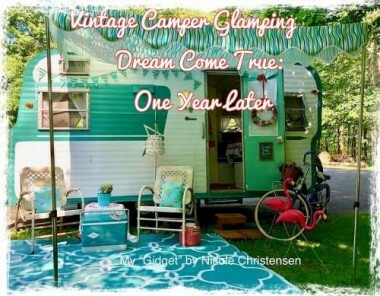 The highlight this summer was last weekend: we (finally) got to go camping and participated in our second-ever vintage camper rally! It’s A Great Big Miniature World! My best childhood Christmas was circa 1977. My dad had a “workshop” in the backyard. Daddy was a traveling salesman; woodworking was a hobby. I’d happily play outside, frequently popping in to see what Daddy was creating. One day, I was no longer allowed in the workshop, the doors locked. Being a curious elf, I tried peeking, but to no avail! I didn’t know what was being built, and curiosity was killing me! That Christmas Eve, I was so excited I couldn’t sleep! 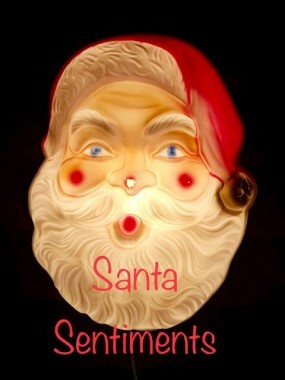 With tree lights twinkling in the living room, a shadow was cast on my bedroom wall: the silhouette of a dollhouse! Daddy built an amazing dollhouse: a saltbox with shutters on the windows, a hand-carved chimney and porch lights repurposed from cufflinks. Mama bought beautiful, handmade realistic furniture to go inside, and a family of German-made dolls. On special occasions my parents would take me to “World Toy and Gift Shop”, a toy store in the Houston “Village”. My dad shopped there when HE was a kid. The store was amazing – much of it “old stock”- with a miniature section like no other. My parents were thrifty, but when it came to toys, I had the best. 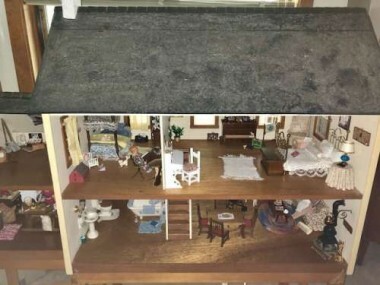 My dollhouse had tiny, choke-worthy pieces a small child wouldn’t be allowed to play with nowadays, but I learned to take care and cherish it. 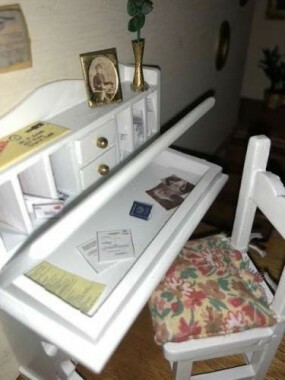 Sadly, when we moved in the late 80s, my dollhouse got lost! I only have the one old photo, with my teenage brother making a funny face through the window (cracks me up to this day). 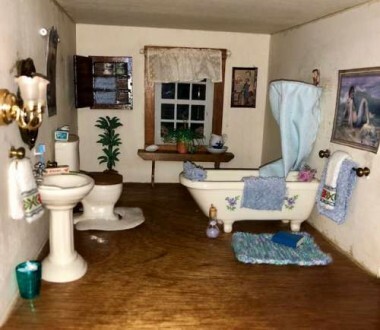 As an adult, I never forgot my dollhouse. For years, I’d search eBay thinking, maybe someday, like a needle in a haystack I’d catch it for sale. 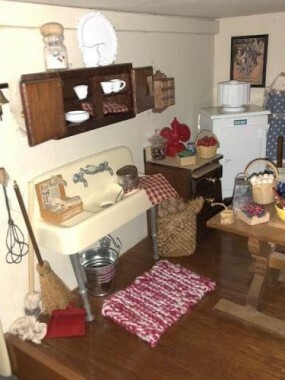 This is the first dollhouse I have seen that reminds me of the one my dad built. 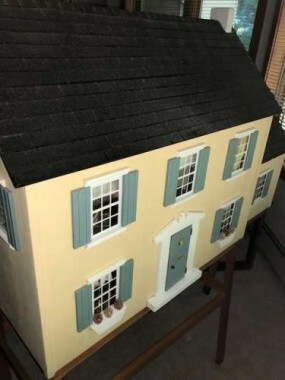 Recently a vintage dollhouse popped up on a Facebook tag sale that looked similar to mine, and my family thought it’d be a great Mother’s Day gift. 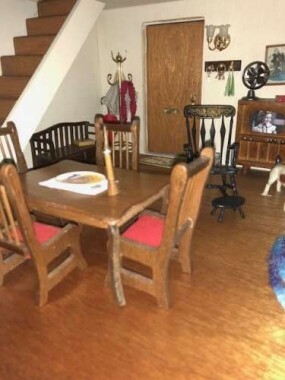 I’m amazed how much it reminds me of MY old dollhouse, learning from the seller that the original owner was my age and that her father built it circa 1977! As a bonus, it came with several boxes of furniture and accessories, some the same pieces I had as a child! It’s like it was meant to be. Sewing the little pillows to the right scale and knitting small blankets and throws wasn’t easy. Miniature scale can be 1:48 (¼”), 1:24 (½”) or 1:12 (1 inch) scale (like mine). Larger scale, or “play scale” is 1:6. 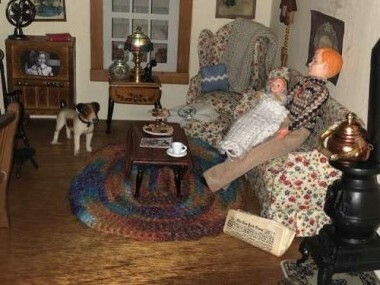 It’s relaxing and fun setting up the dollhouse, now sitting in our living room. I especially love MAKING miniatures! 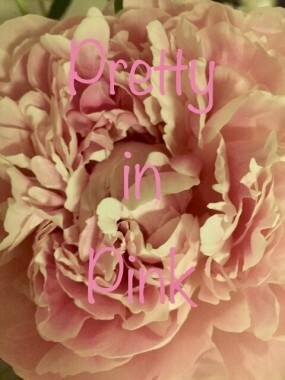 “Printies” are sites with miniature printables you can print. I’ve printed out posters and photos, and made books, comics and jar labels. I’ve made hat, match, food and cleaning supply boxes. Open desk drawers and there’s bills, letters and even a mini passport! 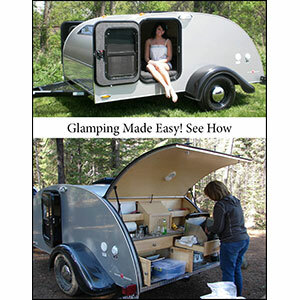 A few of my favorite “printies” sites are printmini.com and jennifersprintables.com. I’ve created dish towels and curtains from ribbon and scrap fabric, making curtain rods from barbeque skewers and beads. 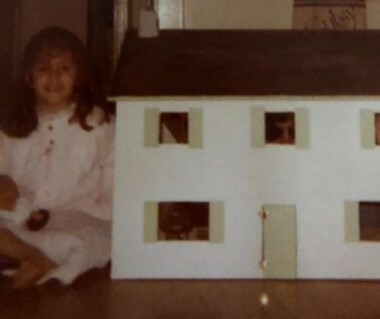 The circa 1977 dollhouse was electrified when we got it, but too scary to plug in. I find that LED lights work great and are easy to move around. I use a tin of candle sticky wax to attach to walls and ceiling. Old rags became towels. I made a shower curtain from fabric and the wire egg holder from a box of Easter egg dye. A thimble became a waste paper basket. I’ve filled jars with real flour and bath salts, and there’s actual soap in the soap dishes. The master bedroom was fun to set up. I knitted the rug and bedding using size “1” needles. 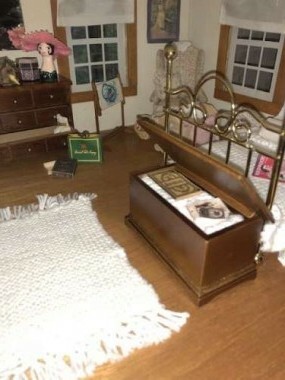 The porcelain kitten in the little girl’s room was mine as a child, and part of my original dollhouse. 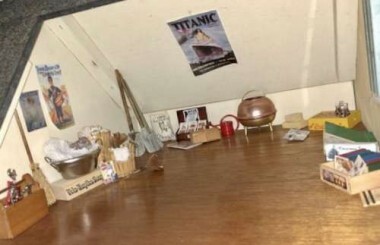 The boys’ attic playroom. I created a half wall by repurposing scrapwood from a home repair project. I love the “sewing room” the most, because I was inspired by my own sewing room in my real house. 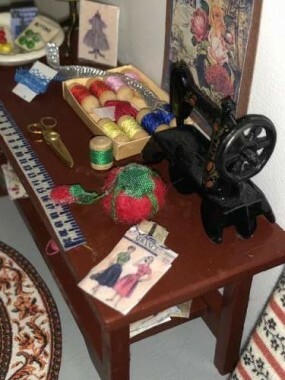 I made many of my own minis for my sewing room, including patterns stuffed with real pattern paper, and a felt tomato pincushion using felt glued around a pencil eraser. I’ve repaired old, broken furniture and and made new bedding and pillows. I’ve taken mass produced items and “dressed them up”. I’ve knitted and crocheted throw rugs, blankets, doilies, and winter wear for the coat rack using the tiniest needles and yarn, usually while drinking my morning coffee. 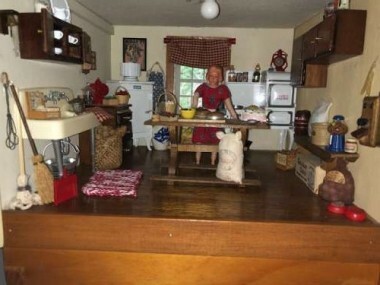 The dollhouse, miniature, and diorama hobby is going strong. 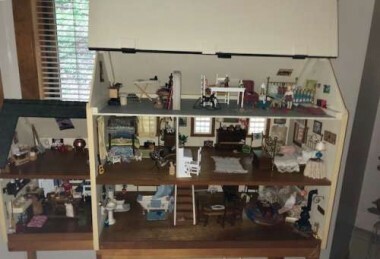 The Facebook group, “World of Dollhouses and Miniatures”, has over 13,000 members! My mini’s theme is 1930/40-something, and while cute, it’s “rough” compared to some of the amazing work of some! I think ours looks pretty good, considering we only started working on it in May. “Miniature Conventions” take place around the world. 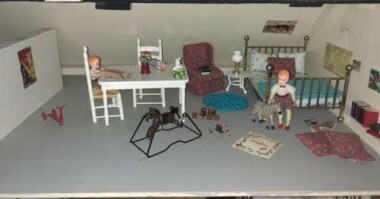 In June, my daughter and I attended the Molly Cromwell Dollhouse Miniatures Festival in Sturbridge, Massachusetts. We were amazed at the jaw-dropping detail! 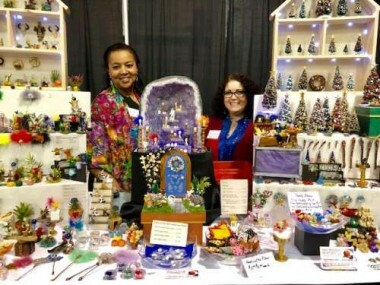 All the artisans showed immense talent, but our favorite booth was that of Lisa Meyer and Stephanie Watt, known as “Mini Maniacs Miniatures”! Mini Maniacs Miniatures (“MiniswithMusic” on Etsy) has everything 1:12 scale to decorate for Christmas – realistic tabletop trees, decorated mantels, wreaths, and dreamy Christmas trees (complete with lights). 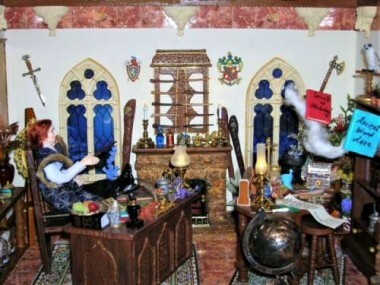 There’s “mystical” items, too- miniatures can be any theme, (think “Harry Potter”, for example). 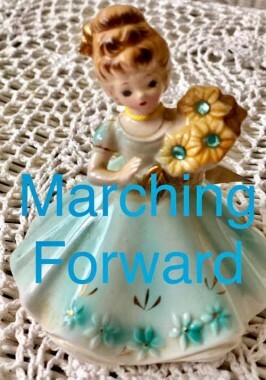 Their detailed work also includes one-of-a-kind vignettes and music boxes featuring miniatures. Lisa, Production and Recruitment Coordinator for the Deparment of Music (as well as a professional singer and choral conductor), and Stephanie, a concert pianist and full Professor and Director of Theory and Piano Studies in the Department of Music, became friends after meeting at Long Island University, where they both work. 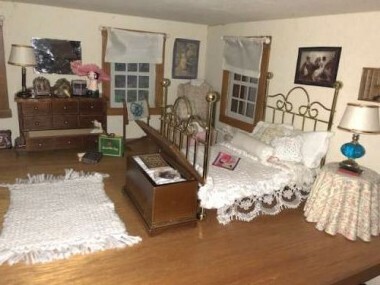 Lisa loved dollhouses as a child. 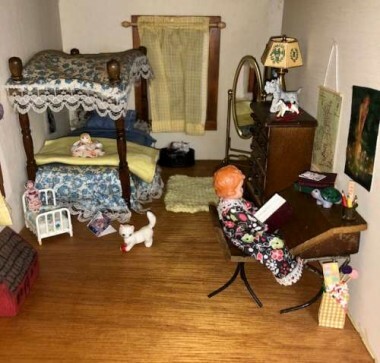 She got started creating miniatures in 2006 while making a gift for her mother, after finding that the pieces she was in search of were too expensive or not available. 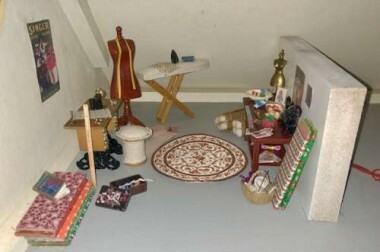 By 2011, miniatures was a serious passion for Lisa and the Etsy shop was born. Lisa loves how the world of miniatures has limitless possibilities, able to transport the beholder to any time or place. She finds all mediums can be used, including wood, fabric, and paint. Both Lisa and Stefanie have won awards for their miniature work. 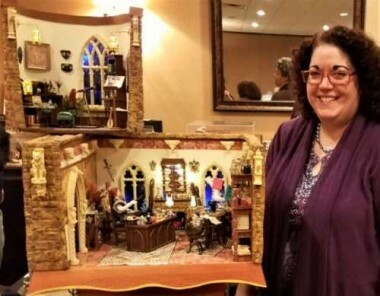 Lisa’s creation, a wizard’s castle, won second place in November 2017 at the Philadelphia Miniatures Show! Lisa and her award-winning castle. 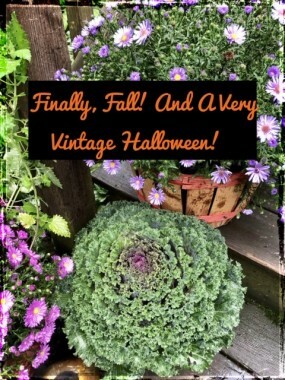 My teen daughter and I have enjoyed decorating and picking pieces for our mini-home at craft stores, Etsy and at a delightful miniature store in our state, Whimsies Dollhouse Shop! We can keep adding to the house, looking forward to decorating it for the seasons, too! 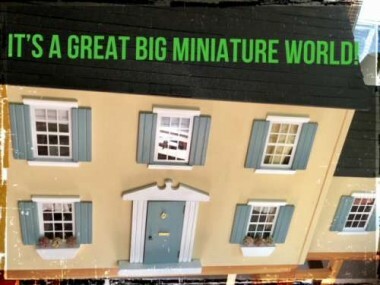 Hope you enjoyed this peek at the world of miniatures! 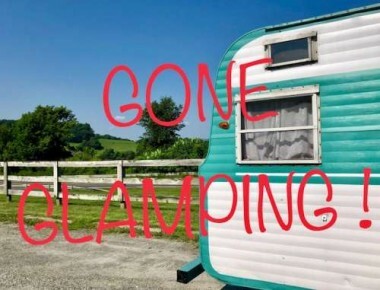 Leave me a comment here so I know you stopped by. Wishing everyone a Happy Fourth of July!